Amazon’s highest rated and best selling DVDs are now available as online self defence and martial arts courses. You can have instant online access to the following self defence and martial arts courses. 140 Combat Moves is Amazon’s most popular, and highest rated, DVD set. This easy to follow step-by-step online self defence program provides you with all the knowledge you need fight effectively. You will learn all the theory, techniques and tactics that normally take a martial artist or security professional years to acquire. – are realistic, designed against specific attacks you may find yourself having to defend against. – are effective, with fast moves aimed towards pressure points and target areas. – require no martial arts experience, anyone can perform these moves with a little practice. Following on naturally from 140 Combat Moves, the 140 Advanced Combat Moves set provides you with advanced principles to fight at a high level. In this online self defence course, you will learn all the theory, techniques and tactics that normally take a martial artist or security professional years to acquire. Get My Black Belt is an easy to follow step-by-step program provides you with all the knowledge you need to be a Black Belt. You will learn all the theory, techniques and applications of Wado Ryu karate to a Black Belt level. This is an online-only offer. It provides the ultimate self defence information with 280 different moves which can be applied to protect yourself in almost any threatening situation. It includes full access to 140 Combat Moves and 140 Advanced Combat Moves. 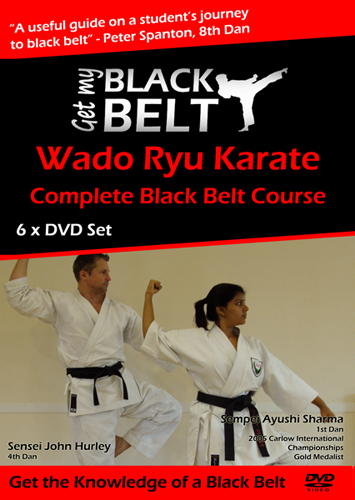 This is an online-only offer, It combines the ultimate self defence package with everything you need to know to be a Black Belt in Wado Ryu Karate. It fuses traditional martial arts with modern self defence techniques to provide you with fully rounded information and experience. It includes full access to to 140 Combat Moves, 140 Advanced Combat Moves and Get My Black Belt Wado Ryu Karate. "I would recommend the course to anyone because it gives you the drive and determination to get what you want."